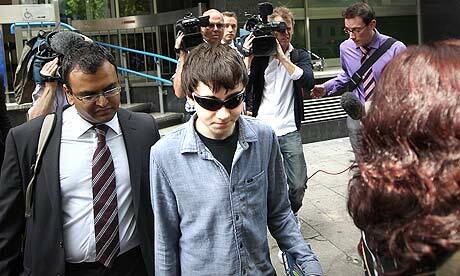 Jake Davis, an 18-year-old from the Shetland Islands, was released on bail after being charged with five offences relating to computer attacks and break-ins by the LulzSec and Anonymous hacking groups. Davis was granted bail to stay with his mother at their new home in Spalding, Lincolnshire, on condition that he does not access the internet either directly or through anyone else. He also has to wear a tag to ensure a 10pm to 7am curfew. Davis, whom police believe used the online nickname "Topiary" and was a member of the LulzSec and Anonymous hacking groups, was arrested at 2.10pm last Wednesday in Mid Yell, an northern island of the Shetlands. Jake Davis allegedly had the login passwords of 750,000 people on his computer. He was charged on Sunday night with offences under the Computer Misuse Act, the Serious Crime Act, and the Criminal Law Act. Davis is accused of gathering data from National Health Service computers, being involved with attacks on News International and being part of an attack that caused the website for the Serious Organised Crime Agency to collapse. It is claimed that the hacking attacks compromised personal data for hundreds of thousands of people via the NHS, and the bank details of a large number of people when Sony Pictures Entertainment was hacked.